I love meeting new people. It’s something that energizes and genuinely excites me. I’m also a firm believer that networking can lead to some of the greatest, even unexpected, opportunities. So, I try to put myself in situations where I can meet and learn from new people, regularly. The irony of living in a city is that it can be hard to meet new people. By your mid to late 20s, you are pretty much at max friend capacity, and not everyone is looking to add a new relationship to their repertoire. But, that’s what I love about Dinner Lab. The laid back, pop-up dinner club concept brings together fellow foodies in a non-committal, unique environment. The communal table seating at each event fosters the opportunity to meet fellow diners, catch up with your date, or do both. When I brought along an old friend, Keara, to check out Dinner Lab last Sunday night, this is exactly what we did. This particular pop-up dinner took place at TechShop, a 24-hour DIY workshop, where members use the space to design and fabricate anything they can dream up. My friend Keara described it as “a massive home-ec classroom.” She hit the nail on the head. The night started with a 30 minute cocktail hour, followed by short remarks from the Chef describing his background and what we could expect that night. We then headed to our seats to start our culinary adventure. I was impressed by how seamless and attentive the service was throughout the night. Our glasses were never empty, and the food came and went at an enjoyable pace – never an easy task when you’re cooking for the masses. 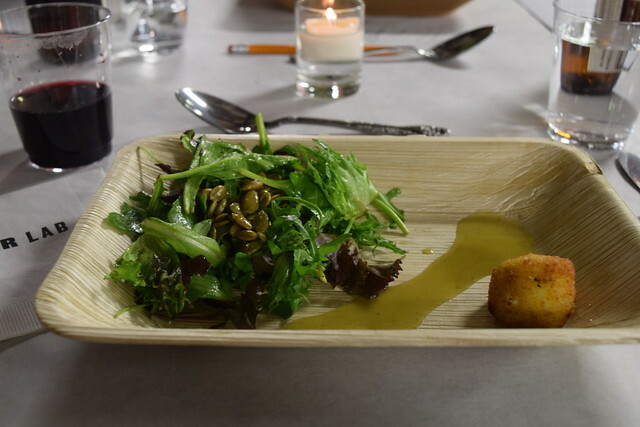 Our first course was a local mixed greens salad with roasted pumpkin seeds and a goat cheese fritter. I loved the saltiness of the pumpkin seeds combined with the warm and crispy goat cheese. As someone who usually only uses olive oil and vinegar for salad dressing, I appreciated the quality olive oil, because it allowed the other ingredients to stand out. 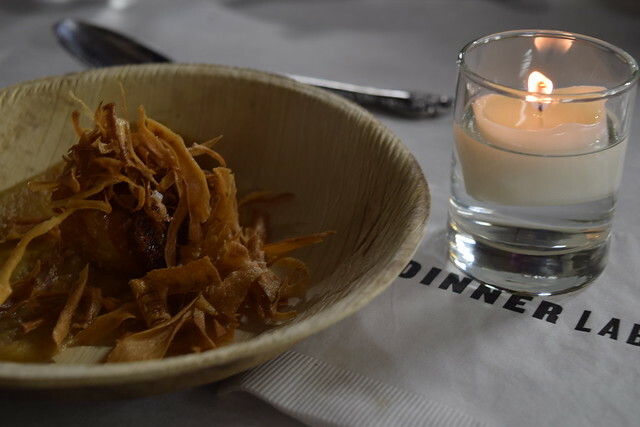 Next we tried the crispy pork belly with turnip crisps and apple compote. The meat was very crispy on the outside, almost hard to cut, but once you got to the tender part, the combination of the fatty meat with the crispy turnip chips and sweet apple compote was divine. In between courses, we chatted with fellow diners and learned that you can sign up to be a Dinner Lab member for free and purchase ad hoc dinner tickets for $75 a pop. Alternatively, you can become a Select Member for an annual cost of $175, which comes with priority access to dinner signups, discounted pricing on tickets, and the opportunity to attend more specialized events ranging from wine dinners and happy hours to chef demonstrations. Next up was the rockfish, which was presented beautifully. 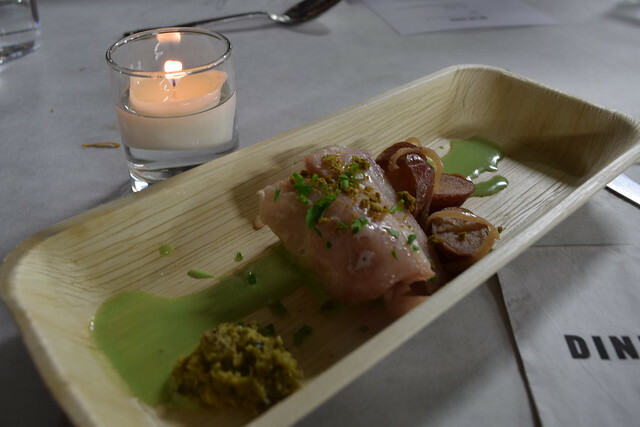 The fish itself was light blush in color – so on trend! – juxtaposed to the green olive tapenade, it almost looked too good to eat! I can’t remember the last time I had rockfish, but we were pleasantly surprised at how the dish wasn’t overly fishy, and picked up the accompanying flavors nicely. However, we also weren’t sure how raw the fish was supposed to be served, because it reminded us of a ceviche preparation. Although our glasses were full of Malbec most of the night, we also received a small bourbon cocktail pairing with the last main course, the duck. The cocktail was light and refreshing and had a lemony, mint aftertaste to it. 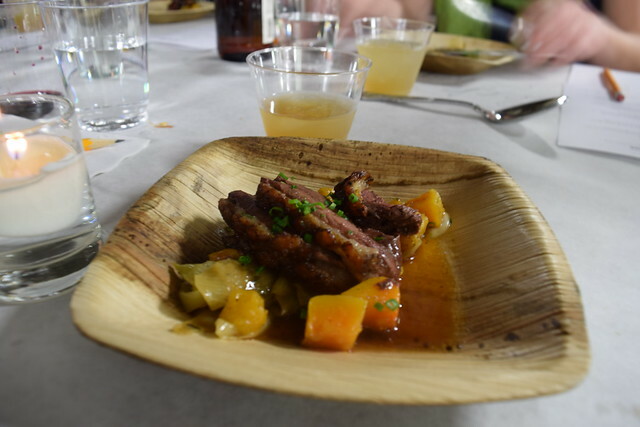 The duck paired with roasted leeks and seasonal squash was delicious, probably my favorite plate of the night. The meat itself though was a bit tough. Nonetheless, we cleaned our plates. As we waited for the final dessert course, we decided this would be a good time to fill out the short survey, rating each dish and leaving comments – which were super constructive and consisted of “serve more of it!” and “:)” – we would have written more, but dessert arrived and we got distracted. 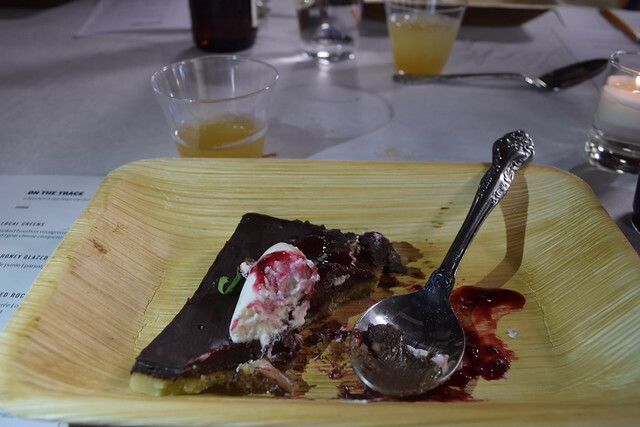 The chocolate, raspberry tartlet topped with bourbon whipped cream was decadent. I’m not a big dessert person, but you can never go wrong when a meal ends with chocolate and whipped cream. 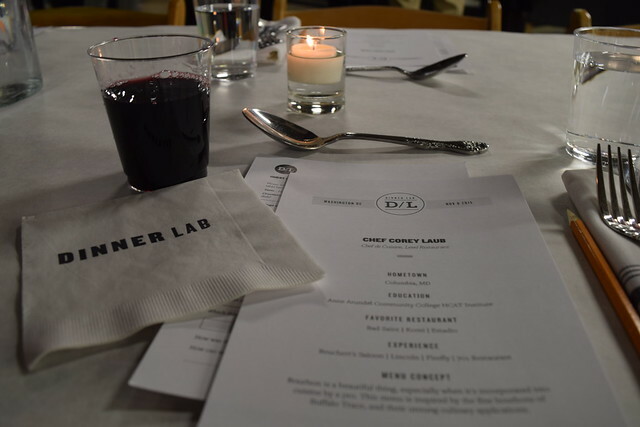 We were impressed with the quality and quantity of food that was served at Dinner Lab and can’t wait to see where the next event pops-up. For anyone who is new to Dinner Lab, they are offering $20 off first time ticket purchasers through this link, which we also think would make a great holiday gift for a fellow foodie. Bon appétit!